(from Billboard Magazine, September 24, 2013) Since the long-awaited iTunes radio launch last Wednesday, Apple has brought in some exclusive sponsors including McDonalds, Nissan, and more. But only one sponsor has managed to gain their own branded station on iTunes Radio, and that’s Pepsi. 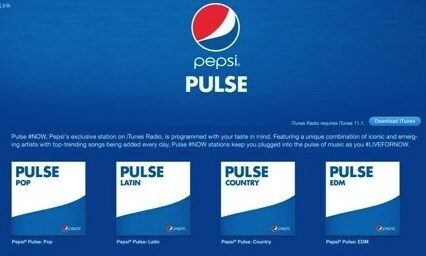 The Pepsi Co now has four of it’s own channels at http://itunes.com/pepsi that have been dubbed “Pulse of Now.” The four stations are made up of pop, country, Latin and EDM (Electronic Dance Music), and will feature Pepsi supported artist such as Mexican dance group 3ballMTY and popular country signer Hunter Hayes. The widely popular Pepsi commercial starring Beyonce will also be appearing throughout the iTunes Radio ad load which includes one video an hour and three additional videos every 15 minutes. Pepsi has a history as being a launch partner with new start ups such as boutique labels and The Voice television show. “Clearly, streaming is not new, but we think there is a lot of growth ahead,” Cooper says. “When you look at the broad Apple ecosystem to us that becomes extraordinarily interesting. The data and the engagement that they have across the entire iTunes platform, the devices that they have and the creativity that they have in terms of delivering a complete, holistic experience for our music gives us the confidence that this could become a critical piece of the broader picture in engaging music fans and our own consumers around music.” Ad packages for sponsors beginning in 2014 will be sold for a minimum of one million dollars and will include a full year commitment.